Travel into the deep earth to find some fossils. Fossils are made when billions of years go by. After all of the sand and rock cover the dead dino. The meat begins to decay or some little dinos start to eat it. I like this photo becuase it shows that you can see the 110 mile-wide crater from way up in the sky. 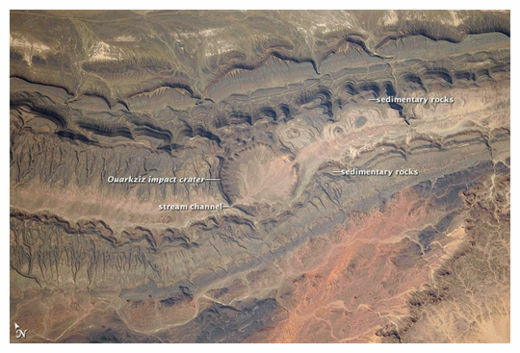 Also becuase the photo tells you what the craters name is, the name is "Ouarkziz". The photo also shows a lot of details and how the crater affected the lands around it. Learn more about why they vanished. On this website it tells why the dinosaurs became extinct. They got extinct becuase of a volcano, from an asteroid. If it was an asteroid than it carved a 110 mile-wide crater in Mexico.